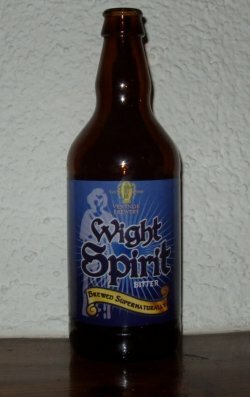 This light but suprisingly strong ale combines the finest aromatic hops and malts to create a fresh quaffable bitter with a citrus aftertaste. Beware! This one may creep up on you when you least expect it ! Cask at Volunteers Arms, GBBF 2007. A golden beer with a thick orange head. The aroma is sweet with estery fruity notes. The flavor is sweet malty again with estery fruity notes, leading to dry bitter finish. The body is thin. Bottled. Lagery gold pour with creamy white suds. Slippery palate. Buttery malt nose. Minimal hop presence. A touch of creaminess in the finish. But otherwise it’s all ashy, watery, antiseptic peat flavours. With a teaspoon of whiskey. Well-made but nearly made me wretch. 1. Cask Handpump at Wilkie’s Tavern, Warrington 12/05/2002 Clear golden coloured. Lasting bitter slight malt finish. 2. Cask Handpump at the Penny Black, Northwich (JDW) 02/11/2004 Golden coloured with fruit and hop aromas. Bitter lasting malt finish. Bottle. Dark golden colour with a slim white head. Sweet fruity malt aroma. Fruity, citrusy, malty taste with a lightly bitter finish. Medium bodied, low carbonation. Clean and pretty crisp. I’m enjoying it. Golden color. Very light hoppy aroma; sea water. Good taste, with some malt and a quite high bitterness. Pleasant. Cask conditioned @ JDW, Soton. Despite being in ’premium bitter’ territory suprisingly average. Reasonably dry with a faint tonic like bitterness in the finish and a very light pearish fruitiness. Golden appearance with a nice bitter aftertaste.Quite refreshing without being outstanding.